If I were to add one of these rainguards to my albion ritter would it be totally out of place? I can't help but thinking of how neat this would look. I've never heard of nor seen evidence of am early to mid 13th century sword having a rainguard. 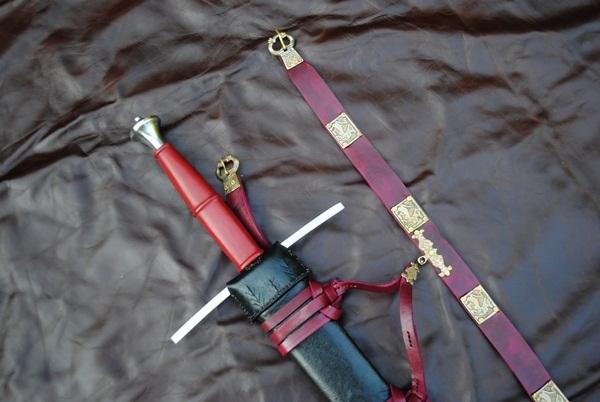 In fact, many of the scabbards we see for swords of that era have flaps that extend up from the scabbard. A rainguard wouldn't fit with those scabbard flaps for sure. had both styles of rainguard......I wonder why that was done? I've finished my own rain guard / chappe project! This isn't a very good photo. In person, the stitching is almost invisible. The flap of grip wrap sewn to the chappe look a bit too plain to me. Maybe I'll add something to that--a slim border? It's very thin leather, so I doubt it would take the "star treatment". thanks to the wonderful information and the traced-through originals in this thread i finally did my first attempt in leatherworking. As you can see the cross leathers are quite short in the drawings, and i freely interpreted the hatching on the right piece as decorative lines. Here it's still drying and unfinished. The leather is veg tanned swedish cowhide, approximately 2,5 mm thick. I soaked and hardened it with water & baking soda for about 20 minutes, then tooled and sewed it. Unfortunately due to the bending as i sewed it the tooling kept disappearing again and again, the imprint was very unwilling to last. As it is my first attempt i don't know if i didn't punch it hard enough, or soaked it too much...or if the leather itself is the reason. However, the repeated tooling and somewhat coarse stitching lead to this rugged and almost used look which is not unpleasant to me since i bought this sword to be a user for test cutting and verifying fencing techniques. So the used look is quite fitting. and developed a wonderful irregular colouring. and then finally went over the sewing and some rough spots with a bit of black shoe polish. An utilitarian sword of a minor fencing student, thats what it is and thats what it happened to look now so fittingly. I'm very pleased. And you should be as your rainguard fits the sword very well and your sword looks even better now. 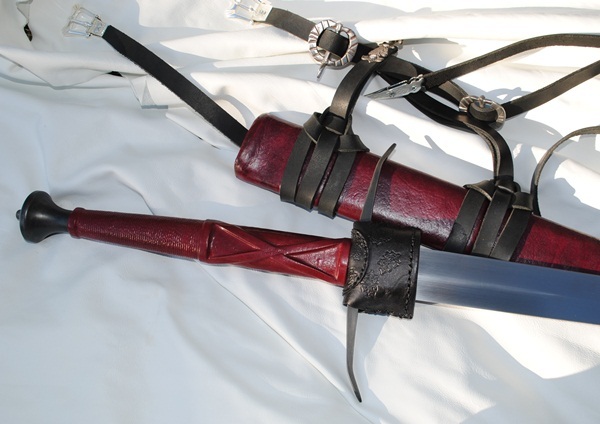 Good job on matching the grip color, choosing the design and molding the leather to the guard. Regarding the tooling you might want to use a swivel knife, to end up with finer lines, especially because the grip has delicate features (raisers etc). 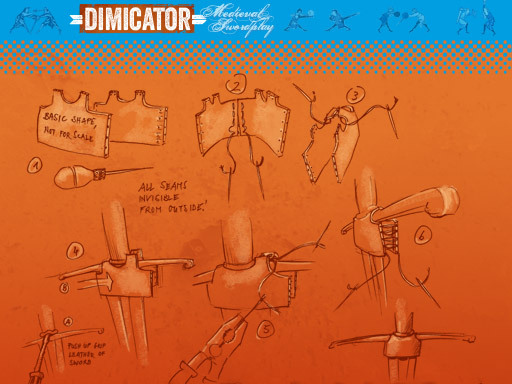 Since with that method you are superficially cutting the leather, there is no chance for it to desapear as the leather dries (no mistakes in the tracing allowed though...). At the archaeological research in 1997, and 1998, on the state square in Dordrecht striking many pieces leathers have been dug up. The gesteldheid of the floor - venige the subsoil and the wet environment, concluded of air - makes that organic material such as leathers, well kept remain. With learning finds must during and are carefully dealt after an unearthing because of vulnerability. Directly if leathers are obtained from the floor the nat are kept in emmertje water. Afterwards it is cleaned carefully. Then it must be conserved leathers. By the inwerking of substances in the ground the composition has however changed of leathers. For closer research it is for this reason the bests the cleaned leathers some time to the air to let dry to most of water have evaporated and treat it afterwards with special impregneermiddelen. For this several products in the trade, but all resources it has been existed mainly from vetsubstanties prevent which must for further desiccation, reinforce leathers and tevens smooth to make. Another conserveringsmethode are vriesdrogen. Both techniques have their specific advantages and disadvantages, but the chance that leathers become after treatment very stiff and shrink, are largest at vriesdrogen. After leathers are preserved can it be described. Beside the forms, such as shoes in a lot of varieties, recognizable for the layman, mouths, swords trip and knife sleeves, oars, grants and clothing fragments, are themselves under the finds not recognizable parts also a lot of. Bits leathers with a derogatory form for example, of which you wonder yourself what that are could be. Leerdeskundige Olaf Goubitz, author of the standaardwerk ' Stepping through Time' , is at present busy analyse learning finds of the unearthings on the state square. Reason too more to leave and ask him speaking for the two rectangular bits decorated leathers of approximately 7.5 at 3.5 cm. Olaf Goubitz have been pensioned but its profession not yet leaves him separately. He is thus still daily busy with examining archaeological leathers from several Dutch and foreign unearthings. The first question which Olaf became were put how old the archaeological leathers from Dordrecht are approximately. Most of leathers that have been dug up in Dordrecht come from the late middle ages, tell Olaf. 95% of it exist from footwear, such a 20,000 fragments so far! Also learn grants, jerkins (clothing), foedralen, knives, daggers and sword sleeves have been found. These objects have been decorated frequently splendidly. In the grants, hanging to the belt, carried people money, keys, a peak, documents and other small stuff. The foedralen were holders for example small planks with waslaag, on which could be written. Also small notebooks, optical devices and sewing things had lederen foedraal. Of which learning type the objects have been manufactured and on which manner they were decorated in the 14e/15e centuries? Sleeves and foedralen have been made of thick, firm (rund) leathers and could be very given full details for this reason to be decorated. With reliëfstempeltjes of for example the fleur-de-lis, ranken, animals and lines. Or from the free hand with tool. Shoes were decorated with cut out and uitgestanste characters; harten, squares, rondjes, rectangles and incisions. Unique for the Netherlands the four in Dordrecht has been found shoes with beschildering of lichtkleurige dot and line. Of jerkins the larger decorated parts are only found. The decoration exists from much short and long cut into. Much learn voorweren after their first use aim were reused, but a jerkin was, after ondraagbaar had become, unsuitable to cut for other use because of the vele it had been cut into decorations. sword sleeves have been generally decorated with simple line work. Olaf weet much concerning archaeological leathers. He is skilful in manufacturing replicas of leathers and he can sign splendidly. Also he makes reconstruction drawings. This way the use aim of even smallest fragmentjes leathers becomes clearly for a layman. This way also for voorwerpjes of this art short sleep. What can tell Olaf about that still? This find of a couple `regenleertjes' is very interesting. Who its sword wants protect against to within leaking rain water did such a leertje around the pareerstang. A type cap, which puts in concerning of the sleeve slid. I'll post full pics of this in the 'Show us your scabbards' thread soon, but I just wanted to show some photos of a 'rain guard' / chappe that Russ Ellis of Tritonworks made for me recently. You'll notice that he sized the chappe to fit perfectly over the scabbard mouth, and built in a riser in the scabbard that the chappe sits flush against. 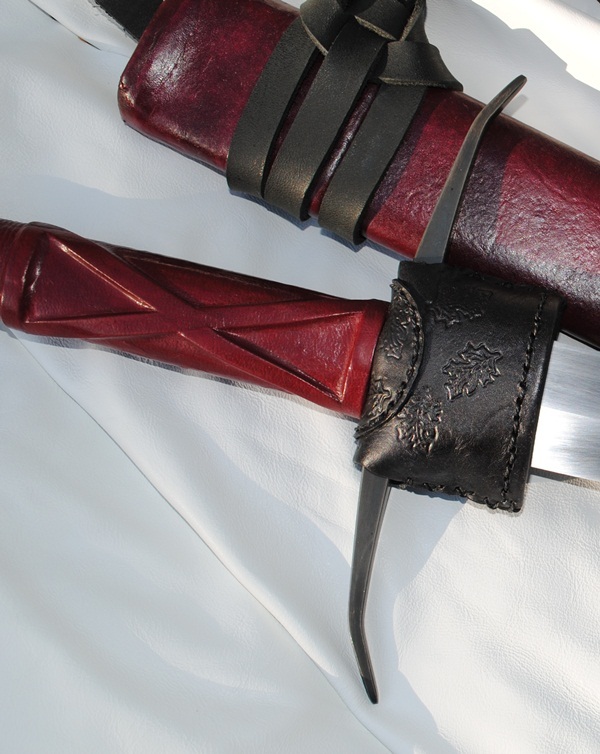 The black chappe on oxblood grip was my request: I wanted the chappe to 'disappear' slightly into the scabbard when sheathed, and for there to be a nice distinction when unsheathed. just a few questions: did you make a completely new handlewrap and stitched it together with the rainguard? Were the guards always directly fastened to the gripleathers? Or was the original, tubular one just stitched around the crossguard? Nice work, by the way! Sorry I missed your question, Thomas! Yes, the grip is entirely by me, made with the chappe in mind. The lower end of the wrap is left long and untrimmed. The chappe is made after the scabbard core is complete and cut to fit it precisely. The hole in the chappe is cut to fit tight around the base of the grip core. It is not compressed by the core. The flaps on the grip wrap are trimmed to half-circles and temporary glued in place on the chappe. Flaps and chappe are pierced with awl and stitched. Sides of chappe are pierced and stitched. This gives you a chappe that works properly, assuming that at least part of its mission is to secure the sword in the scabbard (which is my current theory). Here's another to add to what seems to have become our 'chappe imagebank' - this is the second that I had Russ Ellis make, on another ATrim, also as a 'guinea pig' piece, to allow him to refine his technique. I think you'll be able to notice some differences between this and his first, above. Monumental effigy of Lionel, Lord Welles, a Lancastrian knight who was killed at the Battle of Towton in 1461. His body was conveyed in secret to this tomb in Methley, West Yorkshire. The sculpture is very striking, showing clearly the fashionable hairstyle of the period, and is very detailed in its representation of a contemporary style of armour. This chappe appears to be of the 'flap' rather than 'tubular' construction. For cross-reference: Daniel Wallace has just posted lots of Dürer images in the Images of late 15th/early 16th C scabbard details? thread ... a fascinating diversity of 'rainguard' / chappe styles, shapes, and designs. i'd say that effigy shows a tassle rather than a flap. 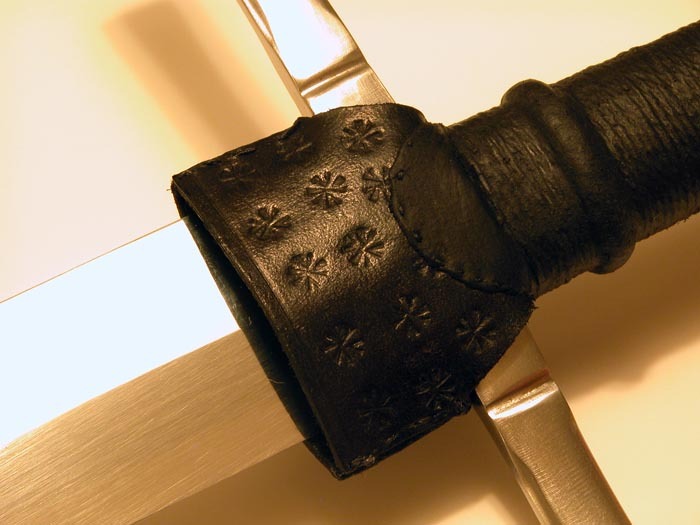 I am still quite certain that this curious leather device around the base of the blade and the central crossguard is unlikely to be a rainguard. This somewhat unfortunate term was coined by Ewart Oakeshott, possibly because it reminded him of a feature that came with modern sabres, designed to closely seal the mouth of their metal scabbards. But while this made sense with these particular scabbards, it was not required for tight fitting ancient or medieval scabbards. 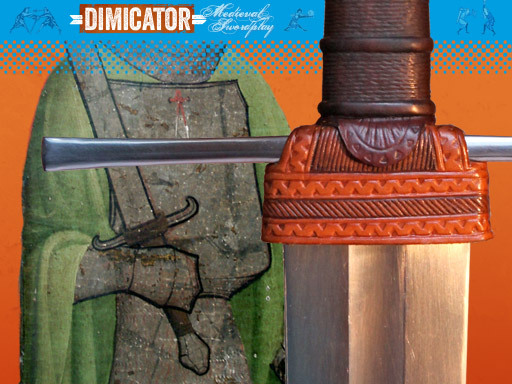 As any re-enactor of medieval periods who has carried his gear in foul weather can attest to, a well made scabbard is all you need to keep your blade dry. If the rain is hard, just pull your cloak around you which covers the sword just the same. After use, clean your sword and oil it. 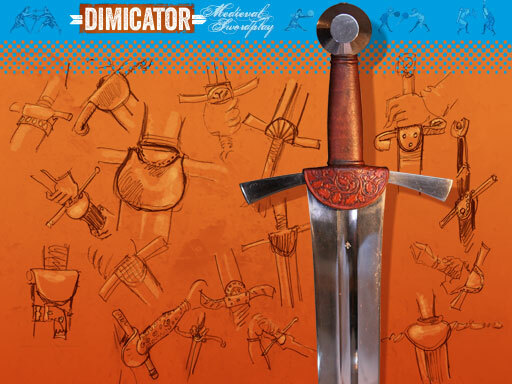 This was good enough for thousands of years of sword history before crossguard leathers appeared in the 14th century and quickly became immensely popular and remained so. If there is one thing that is most unlikely to having been the original stimulus for these devices, then it is rain. Particularly because when the sun is shining again, the leather will be damp and cause corrosion underneath. Dr. Geibig, Dr. Mäder and Peter Johnsson all agree with me on that one. I guess the reason for the sudden appearance and popularity has to be sought elsewhere. I would not be surprised if there was a connection between the rapidly growing availability of swords to commoners: Now swords were used more often and in varying contexts. 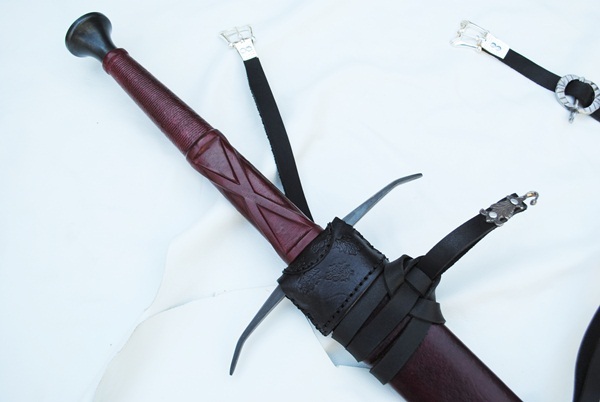 Note also that the crossguard leather came with a new scabbard strap arrangement: Swords were no longer hanging at an angle but vertically at the side of their bearer which is much more practical when moving in thightly packed formations or confined spaces. Apparently, the sword was no longer a knightly elite weapon with the focus on mounted combat. With foot soldiers, ship crews and burghers now wielding swords, there was a sudden increase of sword fights on foot (and the practice thereof), with the majority of combattants wearing less protective equipment of varying quality. I guess that unarmoured swordfighting would have been a lot more common now. My current guess is that, if you train fencing on foot on a daily basis and have neither expensive gloves nor a squire to clean your stuff, a simple and easy to make item like a crossguard leather would effectively prevent your crossguard and the base of your blade from stains that your sweaty fingers would leave. In fact, historical crossguard chapes cover exactly those parts of a cross and blade that you constantly do touch in fencing training. This would also explain why you see crossguard leathers on training swords, too, like e.g. depicted in Paulus Kal and Codex Wallerstein. Modern practitioners ususally do not train as often as their forebears, do not care about their equipment as much (usually not even keeping their training swords in a scabbard) and almost exclusively wear gloves when fencing. This is why they usually do not see the need for such a device. I have reconstructed two crossguard chapes and mounted them on two of my swords. In addition, I have published a brief tutorial on how to make your own. Find the pictures below in a higher resolution here and here. 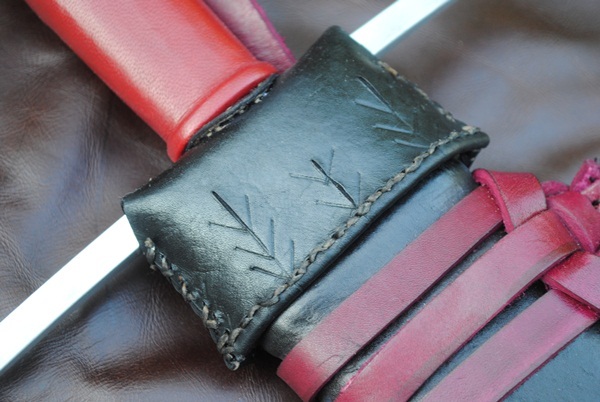 Oh, while we're here, I'm actually making one of these, a semicircular flap type, as part of re-gripping my new H/T Longsword, and I have some questions that somebody here might be able to answer. Are the cross leathers always stitched to extensions of the grip wrap? How thick is the leather on historical examples? How stiff is it? Is it treated or hardened in any way, e.g. boiling, or just molded wet over the cross? Also, I know of later examples with decorative metal plates and studs on the outside, but aside from that were the "rain guards" ever lined in any way, or are they all just bare leather?